The main results and achievements of the Laboratory of Electromagnetic Field-Assisted Methods for Processing of Novel Materials over the period of "October 2011 - October 2013"
The main achieved objective of the project is the establishment of the unique research and educational university unit in the field of electromagnetic methods of consolidation of new materials, including structural and functional nano-materials, which came true. The object of research is the advanced technologies of spark plasma sintering, microwave sintering, high-voltage electric-discharge compaction, and magnetic pulse consolidation of powders. The availability of the laboratory allows MEPhI to actively participate in projects related to the creation of new materials (such as the Russian-Ukrainian joint research project "Development of Methods of Processing and Consolidation of Composites Based on Iron and Titanium Carbides and Borides by Highly Concentrated Energy Fluxes" (grant of the Russian Foundation for Basic Research and of the Ukraine National Academy of Sciences, 2012 - 2013); "Innovation-Oriented Program of Joint Research with Specialized Universities" established by the State Corporation Rosatom; a joint program between MEPhI and the Massachusetts Institute of Technology to create a Center for Science, Innovation and Education as a unit of the Skolkovo Institute of Science and Technology (Skoltech); etc. ), followed by the transition of the research products to the industry. The established Laboratory provides also a unique opportunity to develop novel educational programs to train new scientific personnel able to perform world-class research on advanced materials. Materials Processing Equipment: Spark Plasma Sintering System model Labox- 625 and a unique system Labox-125VHD of spark plasma sintering with hybrid heating (Sinterland, Japan); system Impulse-BM for high-voltage consolidation of powder materials (Potok, Rostov, Russia); magnetic pulse powder pressing system Impulse 8-1 (Potok, Rostov, Russia); high-temperature vacuum tube and muffle furnaces (MTI, USA); a unique system of hot-pressing with an additional source of direct current (Oxy-Gon, USA); high-temperature vacuum microwave system Hamilab V6 (Synotherm, USA); isostatic press (AIP, USA); uniaxial presses (Carver, USA); ball mills, automatic mixers and dryers (MTI, USA); plasma sputtering unit (Denton, USA); dip coater (MTI, USA). Auxiliary Equipment: molding press and glove box (MTI, USA); grinding and polishing machines (MTI, USA and Presi, France); cutting machines (MTI, USA and Presi, France); vibratory sieve shaker (Fritsch, Germany); and ultrasonicator (Qsonica, USA). 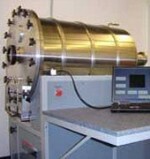 Materials Characterization Equipment: dilatometer (Netzsch, Germany); metallographic optical microscope (MTI, USA); digital scales (MTI and OHAUS, USA); automatic helium pycnometer (Micromeritics Instrument, USA); a universal mechanical testing machine (Galdabini, Italy); microhardness tester (Future-Tech, Italy); laser particle size analyzer (Fritsch, Germany); DSC-TGA thermoanalyzer (TA Instruments, USA). The Laboratory team has made significant progress in a number of scientific fields. A number of the obtained theoretical and experimental results have been used in the development of new methods of consolidation of powder materials using electromagnetic fields. an original description of the physics of densification in the process of magnetic pulse compaction has been introduced. laboratory affiliates have carried out theoretical and experimental analyses of the processing of various types of structured powder materials, including sintering of layered ceramic composites for fuel cells and heavy alloys produced by liquid phase sintering. The conducted research resulted in 63 publications, including 43 articles published, accepted for publication or submitted to refereed journals; two patents, two positive solutions for patents, and two filed patent applications; and 82 presentations at 26 conferences. «Development technology, non-destructive techniques and remote control of pellets and fuel rods during re-fabrication of the mixed nitride fuel». 41 presentations at international scientific symposia. Two basic courses within the laboratory research area "Advanced methods of use and simulation of sintering" and "Modeling process of consolidation of powder materials using electromagnetic fields" have been taught. The laboratory organized two International Schools-Workshops on "Advanced Field-Assisted Materials Consolidation Technologies" in 2012 and 2013. Three young employees had internship in Japan at the corporation Sinterland. Five young laboratory researchers had internship and attended a School-Seminar at Energy Technology Laboratory of the Technical University of Denmark . Six young laboratory researchers participated in the competition of research presentations at the VI International School on “Physical Materials Science”, five of them became finalists, and one became the winner of the final. paper, which has been featured by Ceramics Tech Today . Laboratory staff has established scientific interaction with domestic and international organizations: Baykov Institute of Metallurgy and Materials Science of the Russian Academy of Sciences, Moscow, Russia; All-Russia Scientific Research Institute of Inorganic Materials, Moscow, Russia; the Federal State Unitary Enterprise "Istok" , Fryazino, Russia; company «Diflex», Nizhny Novgorod, Russia; Institute of Electrophysics, Ural Branch of the Russian Academy of Sciences, Ekaterinburg, Russia; Don State Technical University, Rostov, Russia; Tomsk Polytechnic University, Tomsk, Russia; National Research University Nizhny Novgorod, Russia; Institute of Applied Physics of the Russian Academy of Sciences, Nizhny Novgorod, Russia; Frantsevich Institute for Problems of Materials Science of the National Academy of Sciences of Ukraine; Institute of Pulse Processes and Technologies of the National Academy of Sciences of Ukraine; Institute of Powder Metallurgy of the National Academy of Sciences of Belarus; California State University, San Diego, USA; Danish Technical University, Roskilde, Denmark; Royal Institute of Technology, Stockholm, Sweden; University of Leicester, city of Leicester, England; corporation Sinterland, Nagaoka, Japan; and other organizations. Laboratory has been visited by 28 invited scientists from Russia, Ukraine, Belarus, USA, Japan, and Venezuela. All of the guest scientists presented lectures. Spark-plasma sintering (SPS) is an emerging powder consolidating technique, which provides significant advantages to the processing of hard-to-deform materials into configurations previously unattainable. SPS consists essentially of conjoint application of high temperature, high axial pressure and field assisted sintering. The field component is associated with electric current passing through a powder specimen, or if the powder is non-conductive, through the conductive tooling. The electric field generates Joule heat, which provides the conditions of hot compaction; the current also enhances densification and improves the final grain structure in quite a remarkable way. This approach significantly shortens processing and enhances the performance time- and quality-wise. In particular, it carries the potential of maintaining the nano and sub-micro structure in nano-powder-based materials after high temperature consolidation. A technology that is having the potential for meeting the goals of “better, faster, cheaper, and greener” is microwave technology for the sintering of variety of materials. A microwave system typically consists of a generator to produce microwaves, a waveguide for their transport, a cavity to manipulate the microwave field for a specific purposes and a control system for tuning power and monitoring the temperature. A microwave field makes it possible to heat both small and large shapes rapidly, uniformly, and efficiently. This is important in case of crystalline products where undesired grain growth can be prevented by rapid heating and short sintering periods. All these possibilities have the potential of greatly improving mechanical properties and the overall performance of the materials with the added benefit of low energy usage and cost. High-voltage electric discharge compaction (HVEDC) subjects a powder material to the combined action of a powerful electric discharge (10-3 – 10-5 s) and of mechanical pressure. The material, processed under high-power pulse electric current, can heat up to very high temperatures up to the plasma state. At the same time, the applied mechanical pressure produces the desired density of the obtained products. The advantages of this technology include high energy savings (up to 10 times compared to traditional consolidation techniques), environmental friendliness, the retention of the original material structure (nano-scale, or amorphous, in particular), the possibility of processing without atmosphere control, the capability of localized material treatment, and unique final properties of the produced components. HVEDC is demonstrated by video clip. The technology of Magnetic Pulse Compaction (MPC) has shown more promising results compared to other consolidation methods in compaction of nanopowders and long-length parts. For ductile materials, MPC allows obtaining nearly fully dense compacts without a heating stage. Powders of materials that lack ductility can be compacted by MPC to densities exceeding 0.8 of the theoretical density while full densification can be achieved by the subsequent sintering. 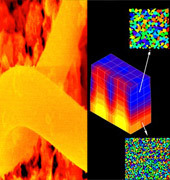 Due to a strained state of the material and high concentrations of defects in the particles, the required sintering temperatures are reduced such that a nanostructure of the material can be preserved in the sintered state. The pulse duration in MPC ranges usually from tens to hundreds of µs. The evolution of pore structure during microwave sintering of ceramics is investigated based on a model of the non-thermal ponderomotive action of a microwave field in ionic crystalline solids. By means of numerical simulation it is demonstrated that the microwave field facilitates the collapse of faceted pores in the ceramics.